Among the Jamestown mysteries, one looms larger than the rest: what did John Smith do to provoke at least five attempts on his life? There was the time Pocahontas saved him from death at her father’s orders--but that is another story. Part of Smith’s back-story remains unknown to this day, but he did or said something to make some enemies, starting with the first voyage to Virginia. The three small ships with 105 men and boys set sail on December 19, 1606, but they did not get far: Contrary winds kept them rolling and pitching helplessly in cold winter seas, within sight of the coast of England, until January 30, That’s 42 days with no shore leave. Imagine. 105 passengers, about 40 crew members total. The flagship Susan Constant carried about 70, the Godspeed, 50 or so, and the tiny Discovery, no more than 20. By February 17 the little fleet reached the Canary Islands for a blessed five days ashore. But it was here that John Smith was “restrained as a prisoner.” For what? Three tiny ships, 105 “men and boys,” 16 weeks at sea:--cabin fever? News traveled slowly across the Atlantic in the seventeenth century: crossings took 8 to 12 weeks or more depending on the weather. Keep that in mind. Sometimes it took longer. For example, think of the historic voyage from England to Virginia of the Susan Constant, Godspeed, and Discovery. three small vessels of 120 tons, 40, and 20 tons. The smallest, Discovery, was 49 feet from bowsprit to stern with a beam width of 11 feet 4 inches, two masts, and an open deck. She may have carried 20 men. 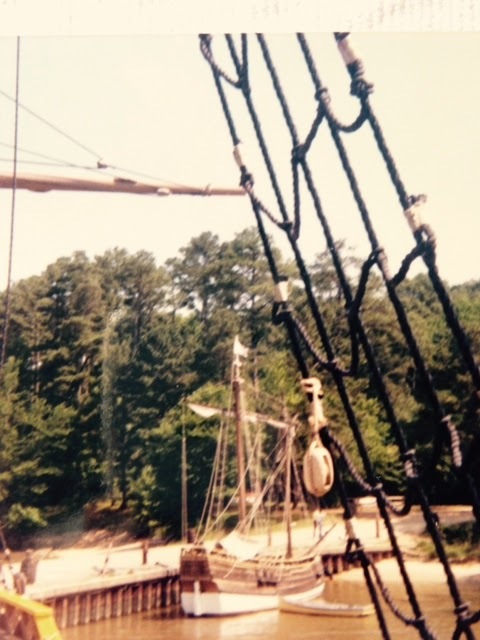 Here is a photo of the replica Discovery, taken from the bow of the replica Susan Constant at their Jamestown moorings. Imagine weeks on the Atlantic in this tiny pinnace. For size, compare with the rowboat in the water off her port side. On December 19, 1606, she and her larger sisters set sail down the Thames, bound for Virginia. On April 26, 1607, after several stops on islands along the way, they finally stepped ashore on the land they called Virginia. Three little ships, 104 men and boys, together at sea for 16 weeks. In 2014 not one, but TWO hurricanes hit Bermuda within the same month. Hurricane Fay arrived first, wreaking damage everywhere, and then came Hurricane Gonzalo, with highest winds of 144 miles per hour. Bermuda has been in the paths of hurricanes for hundreds of years. In fact, Bermuda’s history really began when a hurricane drove the Sea Venture onto Bermuda’s rocks in 1609. But in 2014 this one-two punch was devastating. Historic buildings such as the Commissioner’s House at the Bermuda National Museum.had roofs ripped off. Valuable archives were endangered. Why is this a blog topic now? Because the Bermuda National Museum, a treasure beyond measure of 400 years of history, needs help to restore the extensive damage. And why else? Because the America’s Cup is coming to Bermuda in 2017! Spectators from all over the world will come to watch this world-class sailing competition for the oldest trophy in international sports. It began in 1851, when the schooner America bested Queen Victoria’s royal yacht in a race. The triumphant Americans took home the prize--a cup--and ever since, this race has been called the “America’s Cup”--for the ship, not the place. In 2017, the waters of Bermuda’s Great Sound will be the race course. A special America’s Cup Village at the Royal Naval Dockyard will be a center for teams and fans alike. This will be the first time a U.S. holder--Oracle Team, USA--has defended the Cup outside America. If you want to help the National Museum of Bermuda rebuild and be shipshape before 2017, email accounts@nmb.bm.